Clothing/Jewelry Description A black ski jacket, a black checkered shirt and green slacks. Distinguishing Characteristics Caucasian male. Light brown hair, brown eyes. Bacon has tattoos of a a heart, flowers, an arrow and the name "Mary" on his upper left arm, tattoos of a scroll and his nickname "Dave" on his upper right arm, and a tattoo of a cross on his left forearm. Bacon was last seen leaving for his night shift job at Behr-Manning factory (now known as Norton Co.) in Watervliet, New York at approximately 11:30 p.m. on April 10, 1969. He was supposed to pick up his brother along the way. He never picked up his brother, never arrived at work and has never been heard from again. Bacon's car was found abandoned on Oil Mill Hill, not far from the Waterford Bridge. His lunch was in the backseat and his paycheck was in the front. Authorities at the time assumed he'd left of his own accord, but as time passed and no one heard from him, they began to suspect foul play. It's unclear what, if any, investigation was done at the time, as Bacon's file has been purged from the state police archives. In January 2009, Nelson E. Costello was arrested and charged with murder and two counts of witness tampering in Bacon's case. Costello was Bacon's age and worked as a constable in Waterford, New York in 1969. He carried a gun as part of his job. Costello later moved to Prescott, Arizona. 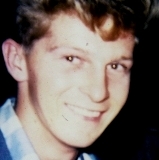 A photograph of him is posted with this case summary. In October 2008, when he realized the police were investigating him for Bacon's possible homicide, Costello allegedly contacted a witness twice and tried to stop the person from giving information to investigators. Authorities believe Costello killed Bacon in a rivalry over a woman whom Bacon was engaged to. They theorized Bacon was shot to death at Alcathy's Marina on Flight Lock Road in Waterford. They don't believe Costello was on duty at the time of the murder. He allegedly had an accomplice who helped him dispose of Bacon's body, but the accomplice cannot be charged because the statute of limitations has run out. In October 2009, on the eve of his trial, Costello pleaded guilty to first-degree manslaughter. He confessed that in his guise as a constable, he pulled Bacon over while Bacon was on his way home from work. Costello told him the captain needed to speak with him. He drove Bacon to an area near a public boat launch and shot him three times in the chest, killing him. Costello stated he put Bacon's body in the trunk of his car, drove it to Bedford County, Virginia, and buried it along the James River. It may have been washed out to sea in a hurricane that struck the area in 1985 and flooded the river. In January 2010, Costello was sentenced to five to seventeen years in prison. He apologized for his actions at the sentencing. Bacon lived in the 300 block of Hillcrest Street in North Troy, New York in 1969; the area is now part of Schaghticoke, New York. He dropped out of Lansingburgh High School and joined the Navy. 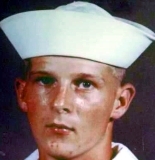 He served in Vietnam and was a member of the Navy Reserves at the time of his disappearance. Bacon has few family members left; he had no children, and his siblings and parents are all deceased. His brother-in-law is still alive and stated he had been a father figure for Bacon prior to his disappearance. Foul play is suspected in his case due to the circumstances involved. Updated 7 times since October 12, 2004. Last updated March 7, 2018; details of disappearance updated.